Garden spiders come in all shapes and sizes, and when questions about garden spider identification arise, most people at least subconsciously think of the family Araneidae, the orb weaving spiders. Due partly to their round, flat webs, Araneidae species possibly rank as the world’s most easily identified spiders. Generally speaking, these garden spiders are man’s second best friend because they provide natural protection against so many insect pests. 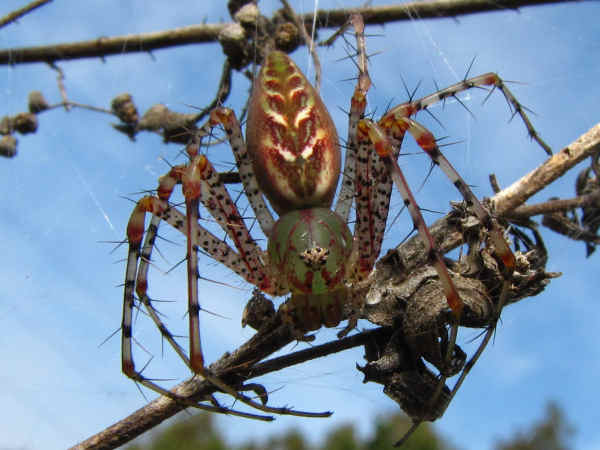 Despite their large size, Araneus generally do not display aggressive behavior around humans. 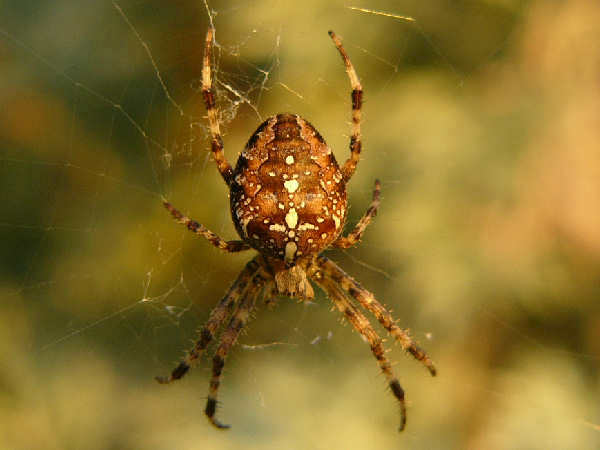 In instances of bites, no Araneus species are listed as spiders of medical concern. Plesse press the Orb Weavers button to see additional spider pictures and information covering the most common orb weaving spiders in the Araneus genus. The remaining portion of the presentation provides additional pictures and descriptions of other common orbweave genera found in the garden. It is followed by a presentation of the hunting spiders commonly found in both the garden and the rest of the yard. Almost everyone in the United States knows that there is a black and yellow spider in the yard or garden. That’s without known the black and yellow spider is a member of the Argiope genus of spiders that are also commonly called writing spiders. The black and yellow spider is often formally called the black and yellow argiope (Argiope aurantia) or black and yellow garden spiders. Writing spider web construction practices make them an easy group to identify. The orb webs include the addition of stabilimentum, or a series of Zs or Xs down the web’s center. Females generally grow larger than males, with bodies averaging about an inch in length and the legs possibly adding an additional two inches to the total length. Having initially identified the spider, the next question on the minds of many people is commonly, “are orb weavers poisonous” or a variation such as “are writing spiders poisonous”. Short answer is no. 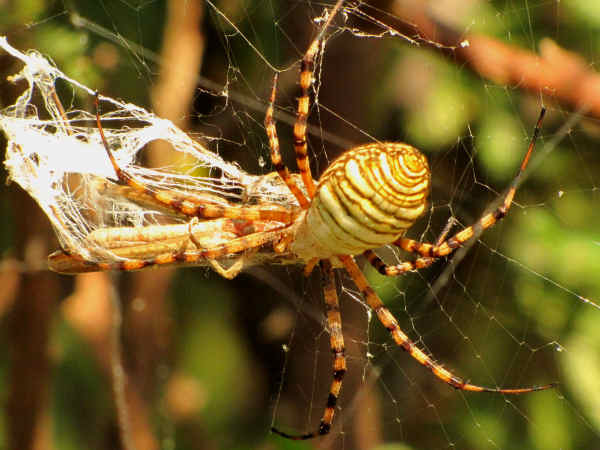 While Argiope spiders are capable of biting, none are known to be aggressive. Like most common home and garden spider species, their presence provides, in economic terms, positive externalities for the homeowner. North America hosts about five Argiope species, however, only two, the Black and Yellow Argiope (Argiope aurantia) and the Banded Argiope (Argiope trifasciata) range across the continent. The picture shows the banded argiope. Please press the orb weavers button for additional information. Juvenile agriopes are known to go overboard in their stabilimentum activity, often producing very elaborate web designs. Agriope web patterns tone down as the spider ages. Often the “Z” or “X” pattern on adult webs is restricted to a couple of short lines in the web. Neoscona, a genus of small to medium sized orb weaver spiders, also go by the name spotted orbweavers. Six Neoscona species spin their webs in North America, although only four species are widely distributed. Three of the four species are presented here. 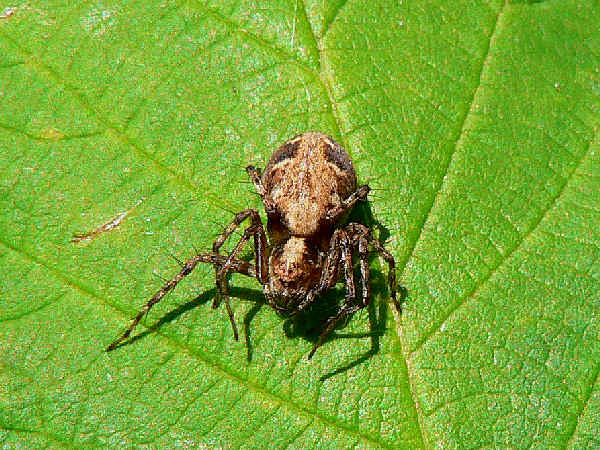 Spotted Orbweavers share many physical traits with spider species in the Araneus genus, especially having rounded abdomens. Often, but not always, the presence of red banded or strongly banded legs serves as a good first identification pointer for the spider being a spotted orbweaver. In addition to the more common wolf spiders, crab spiders and jumping spiders that inhabit residential areas, a variety of spiders that do not use webs, often called hunting spiders, also can be found in lawns and gardens. The picture on the right nicely contrasts hunting spider size from small to large. First up on the picture is a representative species of the Ground Spiders (Gnaphosidae family). They are both small in size and small in total species number. At first glance, many ground spider species resemble colorful ants. A closer inspection of most species in the nine genera show that they share the physical traits of having thin bodies with extended spinneretts on the bottom of the abdomen. The parson spider (Genus Herpyllus) a common spider found in houses, belongs to this group. The first picture in the composite shows a member of the Sergiolus genus, probably Sergiolus columbiana. It is enlarged by a factor of about 5 to highlight the details. Huntsman Spiders (Heteropoda venatoria) occupy the other end of the size spectrum. Members of the family Sparassidae may not grow as big as turnip trucks, nonetheless, they can measure around four inches in length, including the legs. No doubt an initial meet and greet with a huntsman spider scares many a person. Fear not, despite the size, many people consider them welcome guests because of their appetite for other pesky insects such as cockroaches. Three different Sparrassidae species can be found in southern regions of the United States. Heteropoda venatoria, for example, was introduced to Florida and has a strong presence in residential areas. It can also be found throughout the Hawaiian Islands.The picture was submitted by a reader. Along with the large size, the light band across the bottom of the face also serves as a good field identification mark. 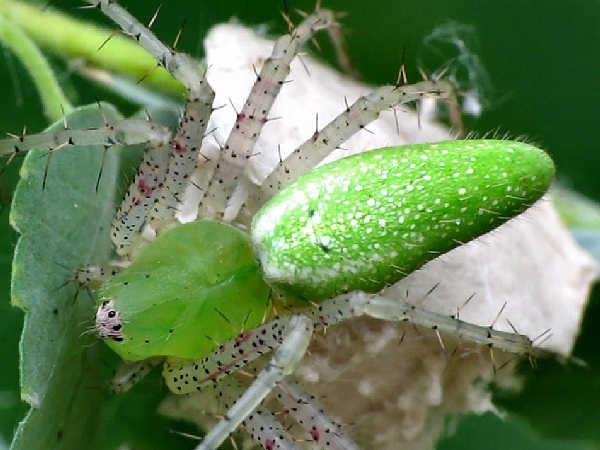 Keep an eye on low growing plants and bushes and you’re likely to find a Lynx spider (family Oxyopidae). They come in two different forms. One genera (Peucetia) and two species represent the green form, the more common subtropical form. Their unmistakable look makes for easy identification. Both species are quite common from coast to coast along the southern areas of the United States. A few species of the brown form of Lynx spiders are common in lawns and gardens a bit further north. 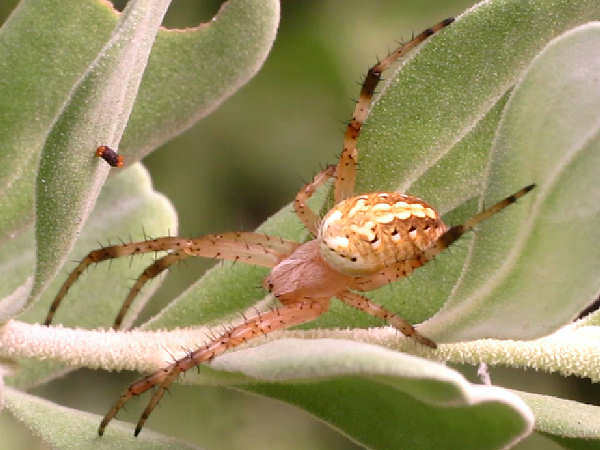 The Western Lynx spider (Oxyopes scalaris) also prefers to spend the day on low growing plants and bushes. Its small size means it could easily be mistaken for a jumping spider. 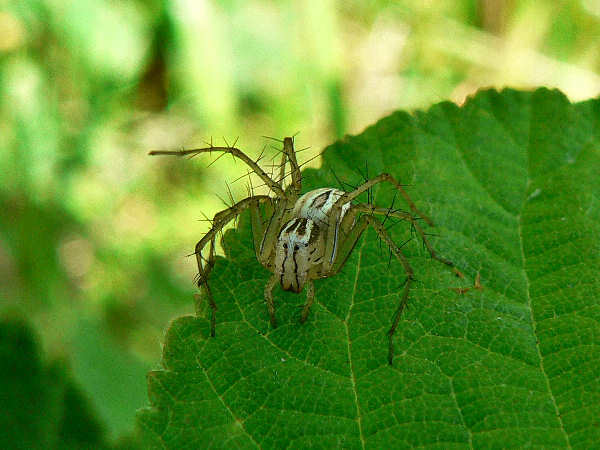 The Striped Lynx (Oxyopes salticus) range extends across most of the United States. The family Pisauridae, or Nursery Web spiders, get their name from their child rearing practices. Nursery web spiders and wolf spiders often look similar, and their identification can be confusing. 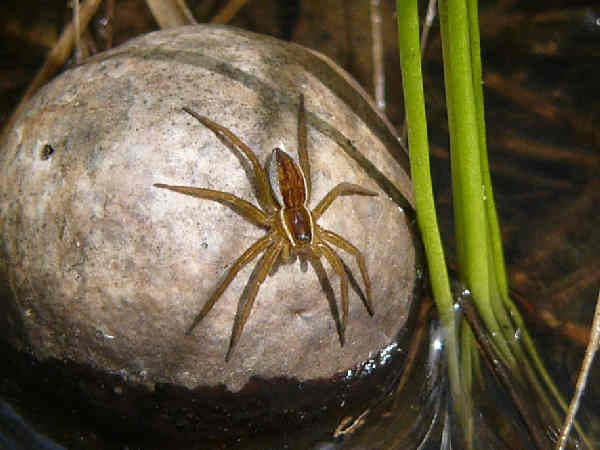 While females of both species carry egg sacs, the female wolf spider carries her egg sac on the back of the abdomen, attached to the spinnerets. When the spiderlings hatch they piggyback on the mother until they are ready to go it alone. 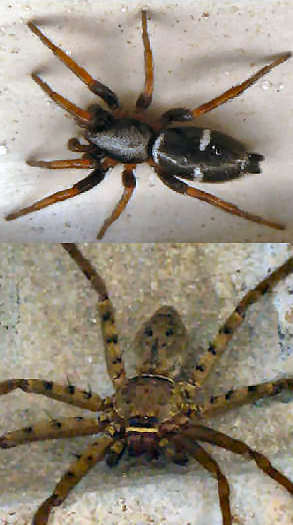 Three genera of Nursery Web spiders live in the United States: Dolomedes (more commonly called fishing spiders); Pisaurina and Tinus. Fishing spiders, engineering marvels as well as a feared predators, rely on neither a ground nor a web based hunting strategy. Rather, they site near water, watching for appropriate prey (insects, minnows etc., al). Once spotted, the spider darts out onto the water to grab the prey. They can literally swim, or as some prefer, walk on water, to reach it. The spider’s larger than average size, stripes and spots makes for easy field identification. Pisauridae species often grow to a fairly large size, with the body reaching one inch in length, or more. The addition of the legs can add another inch or so to the spider’s total length.